He said America’s economy is booming like never before and since his election, the US have added USD 10 trillion in wealth. Dismissing as “fake news” the reports that world leaders were laughing at him during his speech to a session of the UN General Assembly (UNGA), US President Donald Trump asserted that the delegates were not laughing at him but “laughing with me”. Heads of state and government present at the UNGA Hall on Tuesday audibly laughed as Trump began his address by reciting US economic gains under his leadership. “That’s fake news, and it was covered that way,” Trump said at a press conference on Wednesday. “I was in front of a large group of highly professional people, most of whom are from either other countries or the United Nations, people that aren’t big into clapping, applauding, smiling, and I heard a little rustle as I said our country is now stronger than ever before. It is true. I mean it is true. I heard a little rustle. And I said, it is true. “And I heard smiles. I said, I didn’t know there would be — they weren’t laughing at me. They were laughing with me. We had fun. That was not laughing at me. So the fake news said, people laughed at President Trump. They didn’t laugh at me. People had a good time with me. We were doing it together,” Trump said. 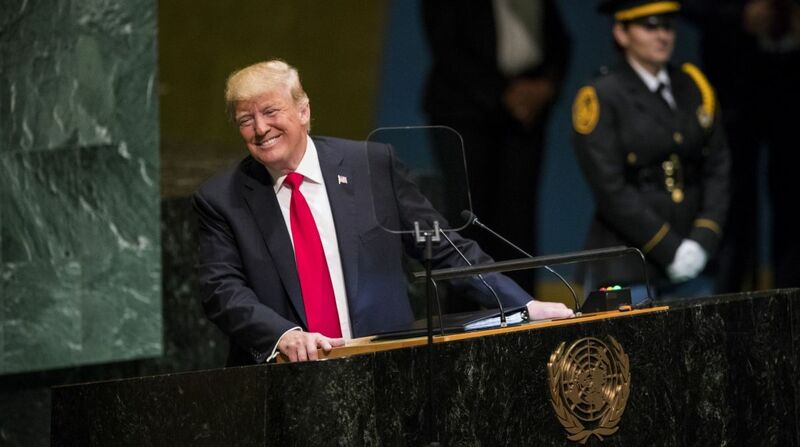 The world leaders laughed as Trump touted the accomplishments of his administration, beginning his UNGA address by saying that his administration has “accomplished more than almost any…in the history of our country”. “Today, I stand before the UNGA to share the extraordinary progress we have made. In less than two years, my administration has accomplished more than almost any administration in the history of our country. So True,” Trump had said. His remarks elicited laughter and claps from the world leaders gathered at the UNGA hall for the General Debate. “Didn’t expect that reaction but that’s OK,” Trump had responded. “The stock market is at an all-time high in history…African-American, Hispanic-American, and Asian-American unemployment have all achieved their lowest levels ever recorded, Trump said. He said his administration has added four million new jobs, including half-a-million manufacturing jobs and has passed the biggest tax cuts and reforms in American history. “We have started the construction of a major border wall and we have greatly strengthened border security. We have secured record funding for our military, USD 700 billion this year and USD 716 billion next year. Our military will soon be more powerful than it has ever been before. “In other words, the US is stronger, safer, and a richer country than it was when I assumed office two years ago. We are standing up for America and the American people, and we are also standing up for the world,” he said.